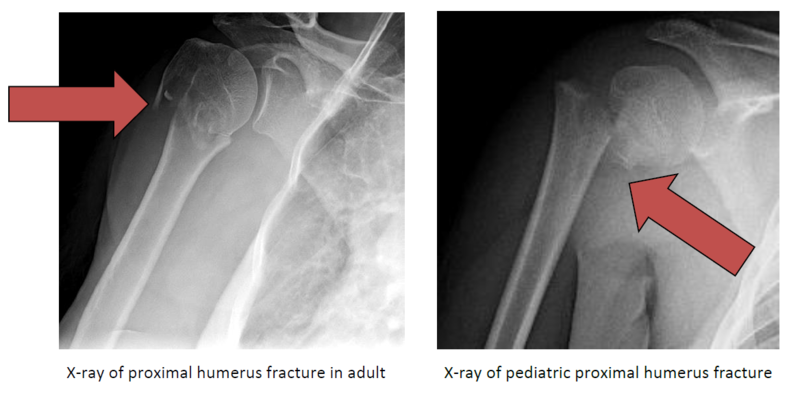 A proximal humerus fracture is a broken bone (fracture) of the shoulder at the ball (humeral head) of the shoulder. These fractures of the humerus typically involve the neck and/or one or both of the attachments (greater or lesser tuberosity) of the rotator cuff muscles. With appropriate treatment and normal alignment of the fracture fragments, healing can be expected. Average healing time is six to eight weeks in adults and four to six weeks in children. Surgery may be necessary to realign fractures that are displaced, or to treat fractures that do not heal properly. Full recovery, including rehabilitation, can require four to six months. If the fracture fragments are in appropriate alignment (position), the initial treatment consists of ice and medications to help relieve pain. Immobilization with a sling or shoulder immobilizer for up to six weeks is recommended to allow the bones to heal along with physical therapy to maintain passive range of motion. Displaced fractures (not in appropriate alignment) require surgery to restore and maintain the fracture in its normal position. 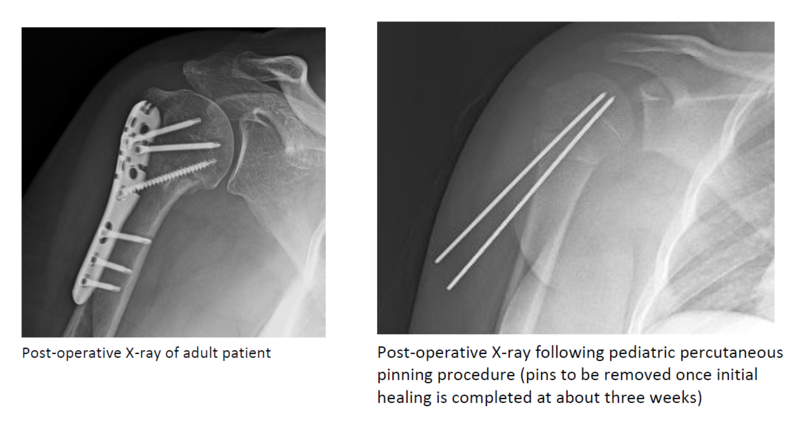 Surgery usually involves repositioning the fracture fragments and maintaining their position with sutures, wires, rods, plates, screws, or pins. Fracture stability is necessary to allow early protected motion to prevent stiffness and functional loss of motion. Following initial healing, moving proximate joints and stretching/strengthening muscles is important. Physical therapists often assist with the rehabilitation process. Rehabilitation often requires four to six months following injury and/or surgery. Strong pain relievers may be prescribed as necessary. Use only as directed.